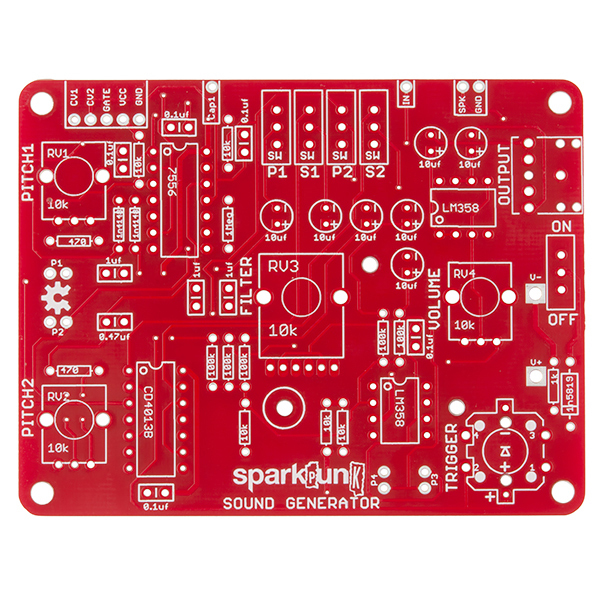 The SparkPunk is a very simple synthesizer, using the somewhat conventional arrangement of oscillators that feed a filter. All you need to know to play this sound generator is to press the button, operate the control knobs, listen to the results, and adjust your music to how you want it. The SparkPunk is intended for you to explore and have fun! Some people are drawn to mellow, soothing sounds, while others prefer clangourous tones, and that's fine, to each their own. With all of the controls, you should be able to explore both ends of the spectrum. While putting mine together yesterday I found out that the box it comes in is magical. I put some standoffs on it and mounted the board to the box and it magically assembled itself. Should really have that in the description, would save people a lot of time putting it together. Tie the grounds on both boards together. Remove the speaker from the Gram Piano. Run a wire from the GP's speaker '+' terminal to the 'IN' terminal on the SP. If you turn off all the waveform selector switches, you 'll get the Gram Piano output, as filtered by the SparkPunk filter. If you turn on the waveforms, you get the GP mixed in with the SparkPunk. 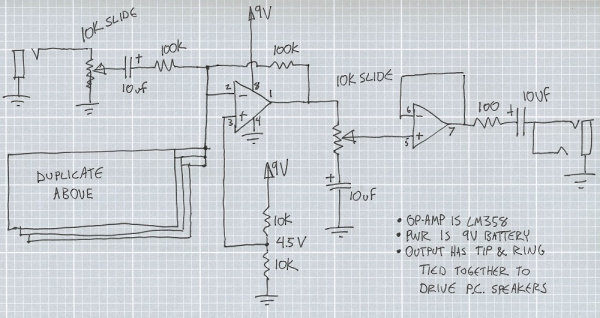 If you're a little more adventurous, you could put a potentiometer in between, configured as a voltage divider, to give you an input volume control. I really enjoyed making this kit. This was my first time soldering IC's, and after this kit I feel much more confident in my soldering skills overall! The way the pitch changes regardless of the position of the switches makes me wonder if I didn't hook it up correctly even though I can definitely tell a difference in the knobs' behavior when P1 or P2 is on. Overall, I'm very satisfied with this purchase, especially for it being a fun kit that left me feeling more skilled after I was done! I'm glad to hear you enjoyed making your SparkPunk! Turn on P1, and turn off the other switches, and press the button. The Pitch1 knob should change the pitch, and you shouldn't be able to hear any response to turning Pitch2. Then reverse that - turn off P1, and turn on P2. Now Pitch2 should change the pitch, and Pitch1 won't have any influence. Then, turn off all four switches and press the button. You shouldn't hear much of anything - maybe some quiet background hiss. If you can try that and report back, I can confirm whether it's working, or help you sort out what is going on. You may have inadvertently found your way into circuit-bending territory! Yah, if you could just, make a video that shows the difference between this and a regular APC, that'd be great. Clearly it's not just "Here's the APC, now with 10% more squealing!" - your modifications, presumably, have added some sort of tangible change to the sound of the device, right? How about a video where you explain, with audio demonstration, what that difference is? Maybe use an oscilloscope to show how the second tone source affects the interplay of the oscillators? How deep do the sub-octaves get? Can this generate serious bass? Your little tune is cool, but not particularly useful. I really do want to see some schematics on that 4-channel DIY mixer. Click it for larger version. Are you guys putting together a mixer kit too, or just the console? 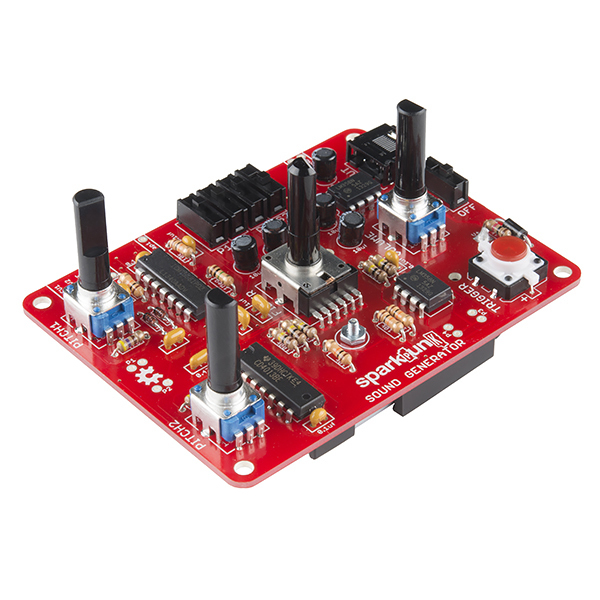 How did Sparkfun get inspiration on this kit? Sooo... Atari came up with it? And is it like a game console? Still a bit confusing. Now it just needs a Vocoder. "the new Daft Punk record" functions, semantically, as a wildcard. Sooo... Atari came up with it and it is a game console package? The original dual-555 circuit was designed by Forrest M. Mims. It's in several of his old books, usually called something stoic like "tone generator." Some lo-fi/noise musicians started building the Mims' circuit, and the name "Atari Punk" was applied, probably because it sounds like the primitive pulse-train sounds that a 2600 made. Games like Combat and Night Driver. It has nothing to do with Atari Co or their products, and isn't a game in itself. The SparkPunk is pretty different from the Mims' APC design. The biggest similarity is that it's something small that takes a 9V battery and makes electronic sounds. Ahhh... I get it now. I actually built a similar sort of sequencer back in the 70s with a 555, counter, 1-of-16 decoder, 16 trimpots, and another 555 as the audio oscillator. It sort-of worked, but the pots interacted some, the TTL decoder didn't really pull things down to ground very well, and it wasn't nearly as configurable as yours. Ah, memories. This is a fun little guy who has quite the sound. Spent hours with friend trying our best to recreate popular hits. Sparkfun mails your order post haste! I was so happy b/c my electronics class were making these together and I really messed my first one up, and when I ordered one on my own, these folks made sure it was sent right away, and this is just regular mail, not express, or fast. 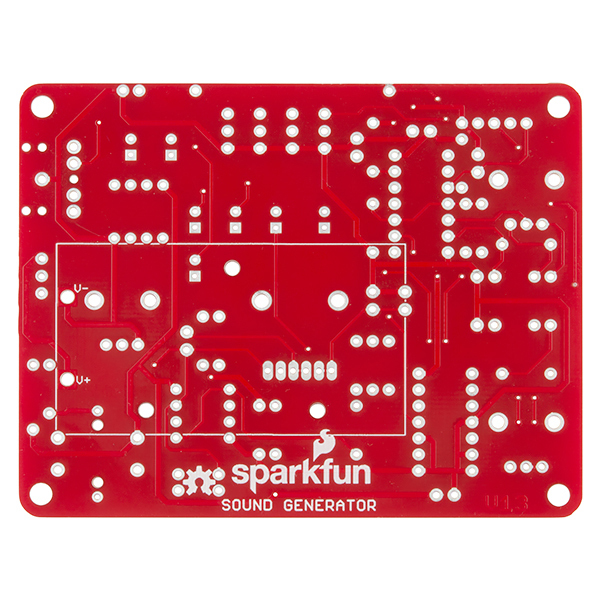 Thanks peeps at Sparkfun, I look foreword to checking out other products from you! I just finished putting this together after receiving it a few weeks ago. I knew some soldering basics but hadn't done it in years, never did it well to begin with. I had this kit together in about 2.5 hours and it worked without any trouble shooting. That's either a testament to me or the kit but I'd bet on the latter. I got this as an intro to building my own modular synthesizers. This was a great place to start and I learned quite a bit along the way. I'll be messing with wiring up some of the extra connections and building an enclosure for it in the near future. This was a fun unit to assemble. The price was good, and the result is a very expansive musical instrument with a lot of tonal possibility. 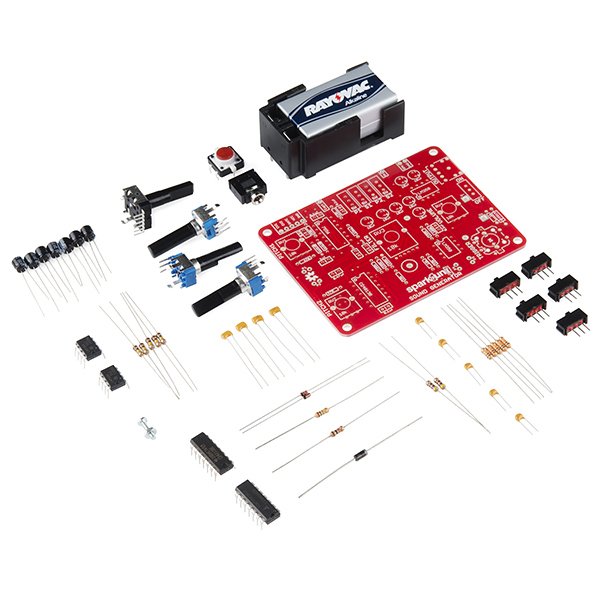 I'm glad all the components came in the kit, including a 9V battery, so I didn't have to buy anything else. it was ready to go. My friends loved it. The LED under the trigger button makes it extra cool. Good work! I'm going to get the Step Sequencer next and chain them together. When friends are over I plug this in to the stereo and they spend hours playing with it. I posted a vid on instagram and now my brother-in-law wants me to build one for him. The breakout modification options are the most fun for me, though. 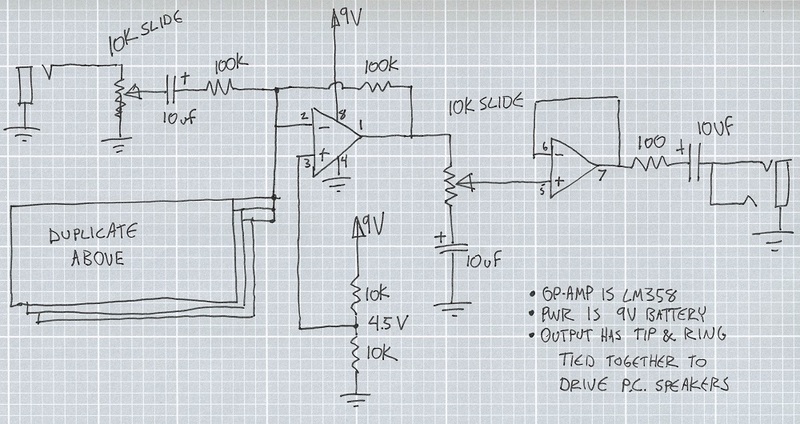 I've been working on some circuits that will allow me to control it with some of my other DIY synth projects. Endless entertainment! Construction was pretty straight forward except they sent a single 555 timer chip instead of the ICM7556. So check your parts when it arrives. The sound is very good for the price. The filter has a bit of resonance and the sweeps sound very cool. The oscillators are juicy analog and make a nice drone when slightly detuned. I recommend adding some knobs.